5 July, 1415: John Huss, Bohemian preacher and forerunner of Protestantism, is burned as a heretic in Constance, Germany. John Huss was a religious thinker and reformer. He initiated a religious movement based on the ideas of John Wycliffe. His followers became known as Hussies. The Catholic Church did not condone such uprisings, and Huss was excommunicated in 1411, condemned by the Council of Constance. Hus was offered a chance to recant and declined with the words “God is my witness that the things charged against me I never preached. In the same truth of the Gospel which I have written, taught, and preached, drawing upon the sayings and positions of the holy doctors, I am ready to die today.” He was then burned at the stake, and his ashes thrown into the Rhine River. 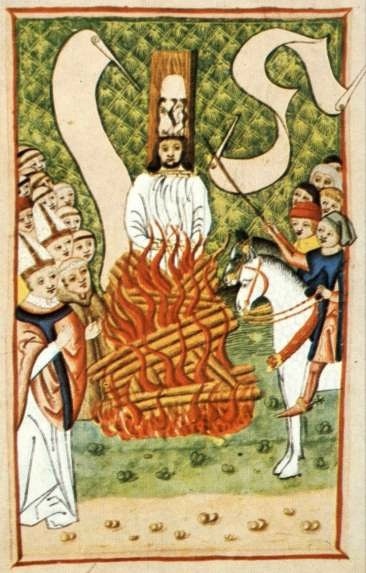 Jon Hus being burnt at the Stake.